Find a specialist in internal medicine at NSMC. If you are looking for a specialist in internal medicine, consider the nearly 100 exceptional internal medicine physicians available at North Shore Medical Center (NSMC). An internal medicine specialist provides primary care for adult patients, diagnosing and treating a range of conditions, and offering physical examinations, routine health screenings and other preventative health care measures. An NSMC specialist in internal medicine refers patients as needed to other NSMC specialists in other areas of medicine, for example, to a gastroenterologist if a gastroenterology procedure is needed, to a cardiologist for a cardiac exam, to an endocrinologist if they need a diabetes treatment plan, and so on. Find a specialist/internal medicine physician. 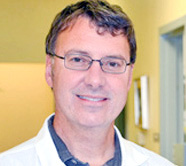 An NSMC specialist in internal medicine works collaboratively with other specialists. Through our membership in Partners Healthcare, NSMC patients have access to some of the world's most talented specialists at other hospitals in the network, including Massachusetts General Hospital and Brigham and Women's Hospital. A family medicine specialist as an alternative to an internal medicine physician. North Shore families may prefer a family medicine physician as an alternative to a specialist in internal medicine. A specialist family medicine provider can deliver primary care for the entire family—from babies up through adults of all ages. In addition to the convenience of having a single physician for all medical appointments, family medicine physicians often have greater insight into family health history and dynamics. Just as an internal medicine specialist is trained in adult health, a family medicine specialist is also qualified to treat a wide range of conditions in adults and provide annual checkups. Family medicine specialists also provide check ups for younger patients, offer age-appropriate screenings and vaccinations, and treat a range of conditions in children. Find a specialist in internal medicine or a family medicine physician near you. Or filter by location to find a Beverly dermatologist, an alternative to gastroenterology Boston and cardiac surgery Boston, digital breast tomosynthesis and more.